Pvt. Seth A. Thomas a military police Soldier assigned to 615th Military Police Company, 709th MP Battalion in Grafenwoehr, Germany administers two mouth-to-mouth respiration to a simulated unresponsive patient Dec. 4, 2015. (Photo by Sgt. Victor Afun, 18th MP Bde. Behavioral Health NCOIC). 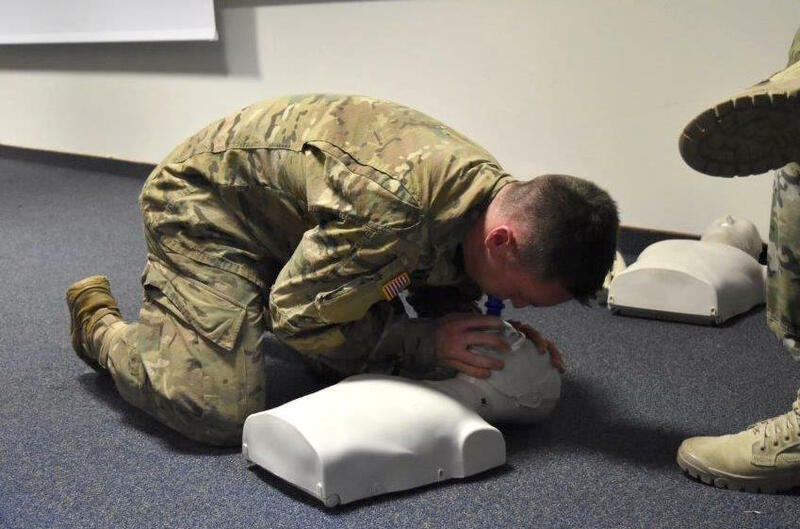 GRAFENWOEHR, Germany – Soldiers from the 709th Military Police Battalion, 18th MP Brigade completed the Heartsaver training program, a nationally recognized Cardiopulmonary Resuscitation and Automated External Defibrillator usage program, Dec. 4 in Grafenwoehr, Germany. The Bavaria Directorate of Emergency Services and the Bavaria Health Command facilitated the program here with the assistance of instructors from the 2nd Cavalry Regiment. Staff Sgt. Justin A. Keown of the Bavaria Health Command, Sgt. Ryne A. Johnson of 2nd CR and Sgt. George P. Tolentino of 2nd CR instructed the Heartsaver course. “The goal is to train all military police who work law enforcement which is likely over 600 Soldiers,” said Maj. Robert Cornfeld, the 18th MP Bde. surgeon. Using a ‘train the trainer’ model, the 18th MP is currently training instructors who will then be able to provide training to their own units at the company level. “One thing I like most about this training is the hands on learning session,” said Spc. Lisa A. Thomas, one of the 15 military police certified as Heartsavers. Equipping the MPs with medical techniques was an important addition to the law enforcement skills they already possess.